If you’re like me, babysitting was your very first job. I absolutely loved it then. It’s flexible and spending time with kids (and making money to do it) is pretty much as great a job as any. Most people think of babysitting as only something that teenagers do. After all, how can you possibly make a full-time living from babysitting a few kids through the week? It actually is possible, but you need to make yourself aware of the business aspect of babysitting for it to work. There’s part-time babysitting, and then there’s full-time babysitting where babysitters treat their job as an actual job that pays the bills. If you’re wanting to turn your part-time gig into a full-time money-making opportunity, then you’ll have to get in the mindset of a business owner. This guide will help you learn about the different types of babysitting jobs so that you can decide which one is right for you. I’m also going to teach you where to find the best babysitting jobs around so that you can take your business to the next level if that’s the route you want to take. There are different forms this job takes depending on the type of work you do. Let’s learn the differences, so you can make sure you’re using the right terminology to find the babysitting job you want. Mother’s helper is a term used for older children and young teenagers who are just learning the ropes of babysitting. If your 11-year-old daughter shows an interest in babysitting, then you’ll probably want to start her off as a mother’s helper before she does it on her own. Mother’s helpers help moms with their kids, so it makes sense how the name came about. Your child can act like a set of extra hands for a mom as she gets paid a small amount per hour for her help. She might do things like feed a baby his bottle, change diapers, read books to toddlers, or prepare lunch and snack for little ones. Some even do some light household tasks, like cleaning or laundry. The whole idea of a mother’s helper job is to ease a child into a future babysitting role and make life a little easier for the mom. If your child expresses interest in babysitting, then you can see if any of your friends with kids might be interested in some help. Or, you can even enlist your child as your own mother’s helper by giving her some experience with her siblings. Mother’s helpers don’t tend to make the same hourly wage as babysitters because they aren’t responsible for as many tasks. You can expect a mother’s helper to get paid somewhere between $3 and $6 per hour. Babysitters can work part-time or full-time, generally on a flexible schedule that works for both the babysitter’s and parent’s needs. Babysitters are usually on an as-needed basis but can sometimes be hired for consistent work with the same family. People who babysit can sit for just one family, or they can work with multiple families to meet their childcare needs, depending on how frequently the babysitter wants to work. You typically don’t need any training to become a babysitter but having credentials like first aid certification can definitely make you a more viable candidate in the eyes of parents. Babysitting rates vary a lot depending on where you live, how many kids you watch at a time, and your experience. You can expect to earn anywhere from $8 to $14 an hour, on average, for one child and the hourly wage usually increases by $1 to $2 per additional child. Babysitters are at work for themselves. There’s no employee-employer relationship. You’ll still need to report your income for tax purposes in most cases, so it’s a good idea to check with an experienced accountant to find out how to do that. Daycare workers do have an employer-employee relationship because they’ll be working in a childcare center that’s its own business. A daycare worker is usually responsible for taking care of several children at one time. The number of children you can be responsible for at a time differs according to local and state laws and the ages of the children. The center at which you work may even have its own restrictions for the number of children to caregivers to maintain a safer ratio. Daycare workers, also called childcare providers or workers, have a lot of responsibilities. They may do everything from changing children to feeding them, putting them down for a nap, and teaching them from a curriculum. Still, this profession is, unfortunately, one of the most underpaid in relation to the work its professionals do. Daycare workers make an average of $11.42 an hour in the United States, according to the Bureau of Labor Statistics. In-home daycare providers do many of the same tasks as people who work in a daycare center, only they do it from their own home. 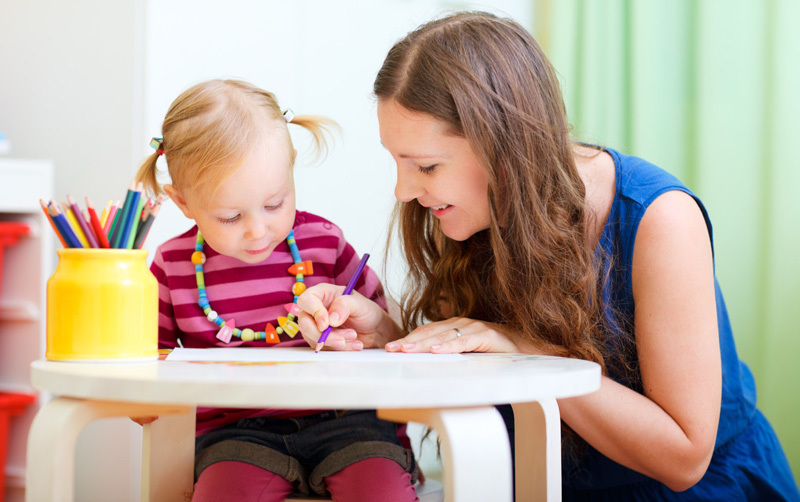 In contrast to babysitting, in-home daycare providers tend to have set schedules with several families who entrust their children in the provider’s care. Most providers need to go through licensing programs through their state to become certified as an in-home daycare provider. Your home must meet specific requirements, too, to make sure it’s safe and provides an enriching environment that stimulates young children. You’ll need to abide by your state’s rules about provider to child ratios, meal time, play time, and other requirements your state puts in place. Much of this will be covered when you go through the licensing program for your state. In-home daycare providers make an average of just over $10 per hour according to PayScale, but that wage can vary a lot depending on where you live, your experience, and your licensure. You can check the licensure requirements for your state at Daycare.com. Nannies are like built-in babysitters. Being a nanny requires a full-time commitment. Most nannies live in the home with the family whose kids they care for and take care of both childcare and some household duties, like cooking and cleaning. Nannies make an average of about $14.54 an hour, which is higher than babysitting, daycare, and in-home childcare provider wages. Another benefit is that most nannies receive free room and board, so they don’t even have to worry about making rent or mortgage payments, which makes their salary even higher. On the other hand, nannies do spend most of their days working and don’t usually have the flexibility that they would from other babysitting jobs. Now you know the difference between the types of babysitting jobs. The following websites can help you get on the path toward finding a family who needs your help, whether you want to be a babysitter with a flexible schedule or you’re interested in being a nanny to a loving family. Care.com is one of the most-used websites for babysitters and families who need them. The great thing about this site is that you can both search for open babysitting and nanny opportunities or post your need for one. It’s free to create your profile on the site. When you do, you can create a listing that includes the types of services you offer. You can even set your rates to make sure you’re getting the income you need. Other people near you can find you through searches and contact you via the website if they’re interested in learning more about you. Care.com also has an app for iOS and Android devices that makes it easier to search open jobs and reply to your messages even when you’re not home. Local Facebook groups related to job listings are perfect for finding babysitting jobs. Search Facebook for groups in your county or town/city that notify people of new local jobs. You can either create a post advertising that you’re open for business (if it’s allowed by the admins) or search for people in need of a babysitter or nanny. SitterCity is similar to Care.com. You can sign up as a sitter, or you can browse the available listings to find a family you want to work with. It’s free to join and set up your profile, but you can choose to pay for an enhanced background check for $60. This will give families a more in-depth look at your background to make sure you’re a good fit for them, and it may increase your chances of landing work. UrbanSitter is a helpful website for those who live in large cities to find work. It’s free to join and use the site, and you’ll get to set your hourly rate. You’ll even get to keep 100% of what you earn, since UrbanSitter.com doesn’t take any fee out of your earnings. Have you decided that working in a daycare is more your style than starting your own daycare or babysitting with a less consistent schedule? If you’re tired of searching “daycare jobs near me” on Google and not finding what you’re looking for, then give these places a try. Again, Facebook groups are really helpful here. Look for local groups that discuss job opportunities. Depending on the rules, you may be able to create a post letting others know you’re looking for a daycare job. Or, search the group to see if any daycares are currently hiring. You can also check the Facebook pages of daycare centers in your area. Sometimes, they’ll have postings for jobs right on their Facebook page. You can find these in the news feed or by clicking the “Jobs” link on the left side of the screen. Indeed is an awesome job search website that I’ve used frequently in the past. The site is very active, so there’s a good chance that your local daycare centers use it when they have jobs available. Indeed is free to use and you can create a profile to save your resume to save time applying to positions. If you’ve already had experience in a daycare center, then LinkedIn may be a good place for you. If you’re not familiar with LinkedIn, it’s basically a social network platform for professionals of various industries. You can network with other daycare providers here and even connect with owners of local daycare centers. More importantly, you can view job listings that local centers have available when they post them on LinkedIn. In some cases, you can even apply right through LinkedIn! The newspaper isn’t dead yet. This is still one of the best ways to find daycare jobs near you. In fact, this is where I’ve seen daycares in my town advertise when they’re in need of workers, cooks, supervisors, and other positions. So I know for a fact that daycare centers still use this method to get the word out. If you’re actively looking for a daycare job, I’d suggest getting a newspaper subscription for at least a month or so. Some newspapers offer a 3-month subscription for a discount, which may be a better way to go to give you ample time to find open jobs. Babysitting is one of those jobs that’s probably always going to be in demand. Families often need babysitters for part-time hours on weekends or for full-time care through the work week. Whatever type of gig you’re looking for, we hope this guide helps you find it. Are you looking for a babysitting job? What type of babysitting job most appeals to you? We’d love to hear your thoughts in a comment. Let us know your challenges when it comes to finding a babysitting job!